Surely you should have known that I couldn't let a PINK FRIDAY during Breast Cancer awareness month go by without a mention of the beloved Filofax? Here is a fantastic chance to make a donation to a worthwhile cause and pick up on the return of the retro organiser. 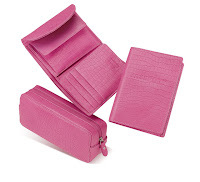 Filofax have produced a special edition leather Pocket-sized leather Filofax in pink for the Breast Cancer Campaign. It features specially printed breast cancer awareness pages and stickers to remind you when to check your breasts as well as unique pink dividers, rulers and papers. 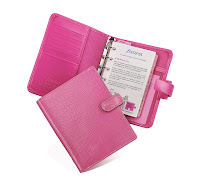 The limited edition retails at £44 and for each organiser sold, Filofax will dontate £2.50 to Breast Cancer Campaign. The original pink pocket leather-look Filofax is still available. This retails at £24 and incorporates the same inserts as the limited edition. For each of these organisers sold, Filofax will donate £2.20 to the charity. There is also a mini Breast Cancer Campaign pen available. You can find more details here. Finally, there are a few Filofax accessories that are worth mentioning (yes, that's right - they don't just make organisers any more). There is a purse (which is on my wishlist if anyone is feeling generous...), an accessories case and a passport cover. The accessories are available from £24 and for each one sold a donation of £2 is made to the Breast Cancer Campaign. You can find more details on the Filofax UK website. If you're succumbing to the lure of the Filofax, you might like to take a look at Philofaxy - a blog for fans of the Filofax.